A confusing history follows the Gibson. The standard story is that sometime in the 1930's, magazine illustrator Charles Dana Gibson asked Charlie Conolly at the New York's Players Club to make something different, so he added a cocktail onion to a ​gin Martini. However, there is another story that recently came out thanks to Charles Gibson. This story goes that Gibson's father's great uncle was the one that actually created this variation of the Martini in the late 1800's. His story is archived below the recipe. So, what is a Gibson? Nothing more than a ​gin Martini garnished with a cocktail onion or three (never an even number - that's bad luck) instead of an olive or twist. The result is a different undertone in the taste of the cocktail, from a briny olive to an earthy, light onion flavor. As with the Martini, use a premium gin and vermouth, adjusting the ratio to your taste. Garnish with a cocktail onion. The onion garnish also marries well with vodka when it replaces the gin. 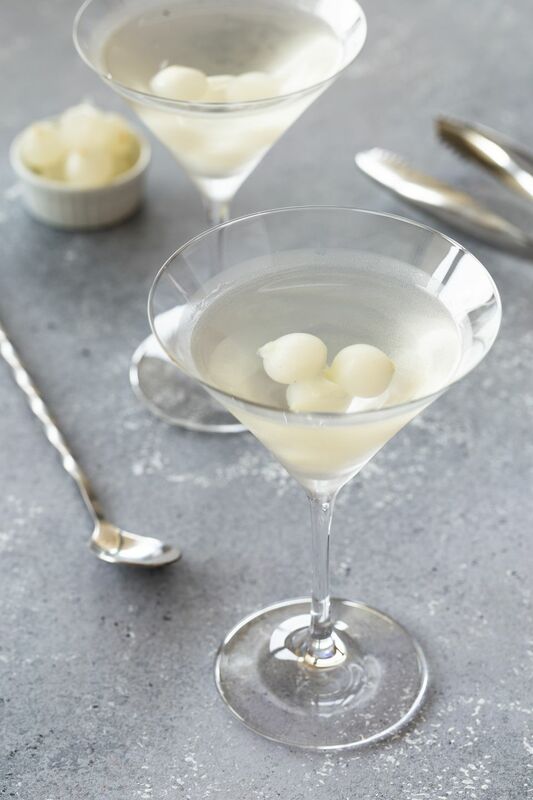 "Sometime in the 1930's a magazine illustrator named Charles Dana Gibson asked Charlie Conolly at New York's Players Club to make "something different" so Conolly used a cocktail onion to garnish a Martini and the resulting drink has come to be known as a Gibson." "WDK died in 1938. I remember that here in San Francisco in my childhood (the 1960's) my grandfather and all the old crowd spoke of the Gibson as being created here and by Walter Gibson, who was the brother-in-law of the "Sugar King" JD Spreckels. The first reference I have seen to it in a bar book was in one printed about 1911. "...Unfortunately, I didn't know WDK Gibson myself but all those who did, my grandfather and my father and uncle remembered him well and the fact that he invented the Gibson. He used to drink them until he died in 1938; and during Prohibition his wife, whose sister was Lillie Spreckels, insisted that the gin be prepared specially at home lest an inferior quality slip in. Alas, I have no idea what her recipe was." So there you have it right from the source (or fourth generation from the source, at least). The Gibson was invented by Walter D K Gibson in San Francisco in the late 1800's. Yet, what about the famous magazine illustrator, Charles Dana Gibson, who is attached to this cocktail? We may not know how he claimed this fame in particular, but we do have his sensuous "Gibson Girls" to enjoy even if we take the cocktail away from him. What a rich family history and great story to pass along. Thank you, Charles, for setting the record straight. An interview with Allan P. Gibson was published by Charles McCabe of the SF Chronicle in the 1970's about his great uncle and the Gibson. This interview can now be found in McCabe's book "The Good Man's Weakness" (Chronicle Books, 1974).